Take a chance on a holster. Prequel to the popular novel Communion of Dreams. Get an early release download or a hand-bound copy in your choice of cover material. So, *why* am I mentioning it here now? 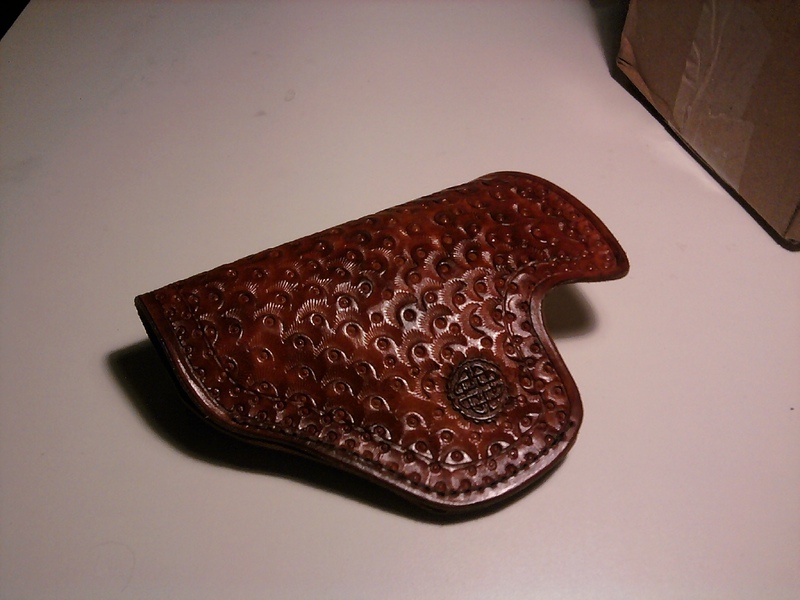 This is a perfectly nice holster, made by Woodenleather.com. It’s marked as being for an “L-frame” S & W revolver with a 2.5″ barrel, but as you can see it isn’t molded specifically for that, and seems suitable for IWB use with a range of medium-to-small guns. I also tried my Steyr S9 and M357 guns, which fit perfectly, and smaller guns such as a Bond Arms derringer would also work, but ride deeper in it. A full-size 1911 and my Colt Python both fit fine, but the barrel protrudes out the end. 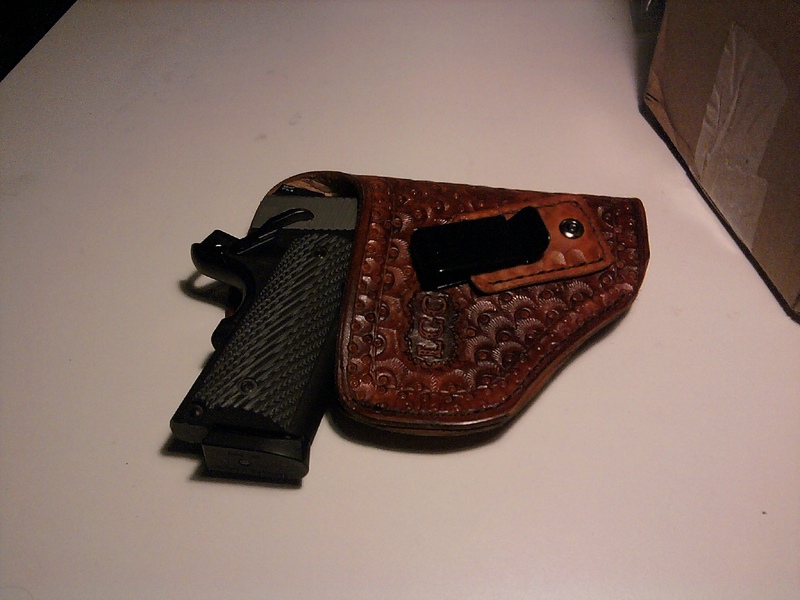 Now, the thing is, while this is a mighty fine holster, it’s made to be either used IWB or OWB left-handed. Note the position of the clip in the second image above. To me, it’s useless (or almost so). As I was thinking of how to find a new home for it, I also got to thinking about several other holsters of varying quality I have which I have wound up with but which I never use and I had another idea: use them for a promotion for the Kickstarter. So, what are you waiting for? Go – get entered! We had 19,937 visitors to the BBTI homepage in May. We’ve added a number of additional review links to the list of Real World Guns. Followers for both Twitter and Facebook have also seen a nice uptick this last month. Back in March I reported on how Google Adsense had screwed us over. Well, after looking at a number of options and being realistic about what kind of revenue advertising could generate, we’ve pretty much decided to just give up on advertising — with one small exception for now: you’ll note that some of the BBTI pages have a small ad promotion my novel. It is proving to be very popular, and the reviews for it have been quite positive — check it out. Of course, we’re still happy to accept donations to help offset expenses associated with BBTI — and thanks to those who have donated! Happy & safe shooting, everyone! Well – I see that I didn’t post stats last month for March. Sorry about that – a combination of being busy promoting my novel as well as getting together with some of the other BBTI guys to do some fun shooting (and to try out a .460 Rowland conversion kit for a Glock 21!). So, first things first: March had a total of 21,499 visitors, and April had 19,918 visitors. Just a bit of a slow period there. Next, remember that we’re now linking from the BBTI page on Real World Guns to reviews of said guns I’ve written for Guns.com. There are usually a couple new each week, so check back often! And here is the first of some additional reviews from my shooting expedition the beginning of April: Wise Lite Arms Sterling 9mm. Coming weeks should see more than a dozen other reviews of handguns and PCCs (pistol caliber carbines). A quick note that things with my novel have been going great, and so far some 14,000 people have downloaded the Kindle edition. If you enjoy my reviews and articles, then you may want to check out the book – it’s been getting a lot of really good discussion and reviews.